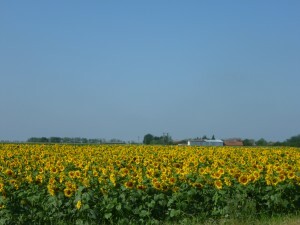 I gasped when we rounded a bend in the highway and I caught my first glimpse of the sunflowers. Yes, sunflowers. Acres and acres of them lined both sides of the road in all their bright yellow glory. It made me laugh out loud. Up until that moment, I had no idea they were a crop in Hungary—or anywhere else for that matter. I’m not sure the flowers knew, either. They were absolutely beautiful, bobbing their heads in the breeze, smiling as we went by. Of course, to the nearby farmer riding his tractor, those plants are his livelihood. They’re a cash crop, one of Hungary’s most important. Whether he notices their beauty or not, I have no idea. He’s busy keeping an eye on the weather and checking for pesky invaders like ragweed infiltrating his fields. Where I saw beauty, he saw money. We pulled over to take pictures. How could we not?? My stunned surprise that something I’d always considered decorative represented someone else’s livelihood got me thinking. How often do we make assumptions or snap judgments–and then leap to conclusions based solely on our personal view of a situation or person? Remember the old saying: Don’t judge a man until you’ve walked a mile in his shoes? Whether you’re writing a story or dealing with your kids today, stop a minute. Step back a few feet and switch seats. If you do, instead of seeing a dusty field, you just might discover sunflowers. Gorgeous photos. the hardest part of writing books for me is putting myself the the other character’s perspective. I have to constantly remind myself that this character would see things differently from me. Your sunflower field versus cash crop is a perfect example of this. Thanks, Lynne! I have to remind myself of the same thing–when I write and in real life. Everyone’s perspective affects how they see the world! Gorgeous photos. 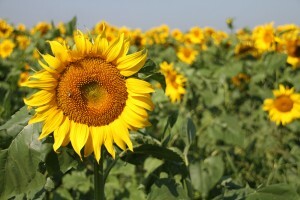 I remember driving past a field of sunflowers onthe way from North Central Texas to Colorado. Thanks for sharing. So glad you enjoyed them, Caroline! Exactly! Always more than one perspective on things, isn’t there?? Keep writing, my friend!